Join the National Academy of Medicine (NAM) on November 29 as it hosts the first webinar in its Culture of Health Webinar Series. The National Academies report Communities in Action: Pathways to Health Equity identified 9 social determinants of health and how these determinants impact our health and the health of our communities. The report also defined health equity as the state in which everyone has the opportunity to attain full health potential and no one is disadvantaged from achieving this potential because of social position or any other socially defined circumstance. Health equity is crucial and health inequity is costly. All actors in society—residents and community-based organizations, in partnership with businesses, state and local government, anchor and faith-based institutions—have the power to change the narrative and help promote health equity. But where and how can communities begin to unpack the social determinants of health in order to achieve health equity? 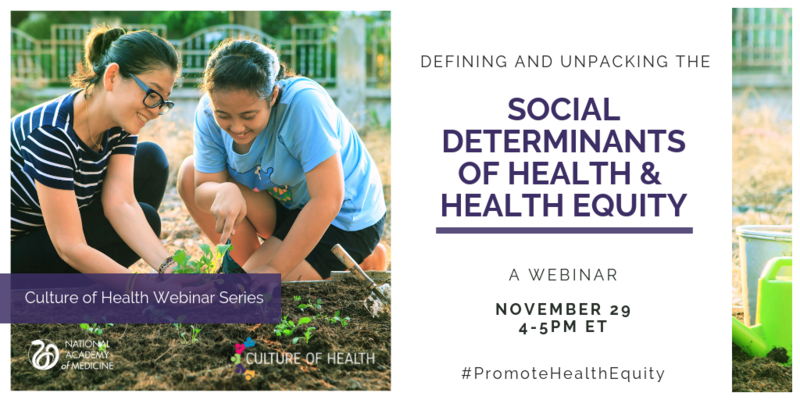 Discuss how public health officials and others working in communities conceptualize the terms social determinants of health and health equity and how this knowledge is applied to their work. Explore the Bay Area Regional Health Inequities Initiative’s (BARHII) Framework for Reducing Health Inequities and the Initiative’s approaches to working with partners to create healthy communities. Provide an overarching perspective of how communities are addressing the social determinants of health and health equity while highlighting the City Heights neighborhood of San Diego, California. Audience Q&A will give webinar attendees the opportunity to engage with the webinar speakers. The webinar is open to the public and will be hosted on Zoom. Please register on this page. Webinar login information will be sent to you prior to the webinar. Each webinar will be archived and materials will be posted on the Culture of Health Program webpage following the event. Questions? Please email Ivory Clarke at IClarke@nas.edu. The Culture of Health Webinar Series will be held over the next year to provide exemplars and resources to help build the capacity of communities to advance a culture of health. The series will host experts working across national, state, and local levels to highlight and share tools and tactics that communities can leverage to advance health equity.